Navon N670 is a light and slim GPS navigation device, notable for its high quality and functionality. It has a large 5” TFT touch screen with 65 thousand colours. SiRF Atlas IV 500 MHz processor and Microsoft Windows CE 6.0 operation system provide most favourable user experience. The device has a microSD slot supporting memory cards up to 8 GB, as well as a miniUSB interface and a 3.5 mm minijack. 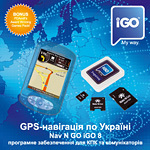 Premium class iGO Primo navigation software is preinstalled on the device. Numerous software functions include calculating several route variants (fast, short, easy and “green” – for minimum CO2 emission) and comparing them, 3D rendering* of city maps and landscape, several options for POI and address search and much more. An important feature is search for house numbers with fractions or letters and navigation through in-block passages in residential districts. iGO Primo contains an up-to-date map of Ukraine with detailed coverage of 616 settlements, including all regional centers and all cities with more than 130 000 inhabitants. For 1 year free map updates are available. The users can also purchase additional maps of other countries. 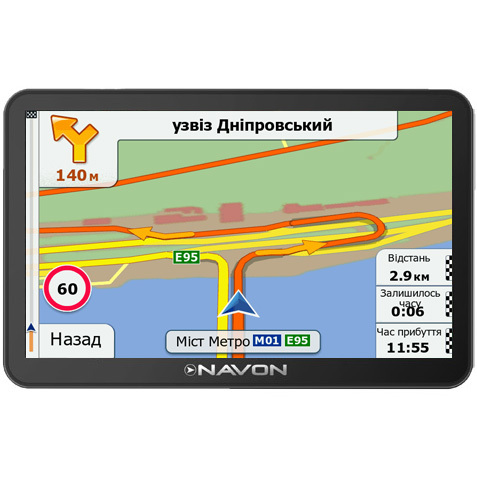 Navon N670 can be used not only for navigation. The device includes functions for listening to music, viewing films and photos. It operates from a rechargeable lithium-ion cell, a car charger is included.